What Are The Different Types of Sprinkler Heads? You might not spare much thought for sprinklers, or for that matter, sprinkler heads. You might not spare much thought for sprinklers, or for that matter, sprinkler heads. But believe or not, there are different types of sprinkler heads. Have you ever considered that the kind of sprinkler head that you need in your building might be different than in the neighboring building? Depending on the environment a structure provides, a different sprinkler head might be in use. These six characteristics identify the purpose of a sprinkler head. Beyond these factors, there are two main types of fire sprinkler heads. These two categories are called quick response and standard response. Why are they so different? These sprinklers are meant to fight different fire hazards. These sprinkler heads are meant for smaller fires and less dangerous fire hazards. Quick response sprinklers are located higher up, so when they begin to dispense water, the water hits the ceiling. Cooling the ceiling down serves to discourage the fire from rising. People can evacuate the premises much more quickly and safely. You will find QR sprinkler heads in hospitals, schools, and offices – any building that is typically densely populated. Unlike quick response sprinkler heads, standard response are more specialized. SR sprinkler heads are familiar sights in factories or warehouses, where heavy industry is taking place. SR sprinkler heads aim to control a fire by ejecting enough water to prevent the fire’s spread. Sprinkler heads near the fire will be the only ones to dispense water. Depending on the size of the fire, more sprinkler heads may be needed to control it. The main difference between the types of sprinkler heads is temperature. 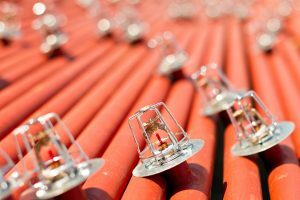 Quick response sprinklers don’t need to detect as much heat before they activate. SR sprinkler heads, however, will take longer to turn on. The physical size of the two sprinkler heads is also different: SR sprinkler heads are slightly larger – 5 millimeters – than their QR counterparts, which measure 3 millimeters. This entry was posted on Friday, August 25th, 2017 at 3:03 pm. Both comments and pings are currently closed.